Experience the Exterior of the Chrysler Pacifica | Big 4 Motors Ltd.
Big 4 Motors Ltd. wants to make it easy to have a family minivan that is both stylish and highly functional. The new Chrysler Pacifica was designed to be sleek and beautiful while still having the ability to get you and your family to your destinations safely. When you're driving through Calgary, both you and your passengers will enjoy the tri-pane panoramic sunroof. Open and close the panes with a simple button and let the outside in. The Chrysler Pacifica comes with hands-free sliding doors so that you can open your vehicle without having to put down your groceries or anything else you're carrying. You can also choose to get a hands-free liftgate. 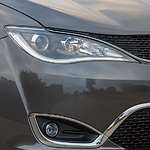 To maximize the visibility of the Chrysler Pacifica, it can come equipped with daytime running lights. For driving at night, you'll love the HID headlamps that will maximize the distance that you can see ahead of you.